Great for families, this is a safe, fun, and well-planned experience. From a luxury bus, to free bottled water, to your own charging outlet, and a relaxed pace, we have your comfort in mind. To go, book yourself online or call (305) 260-6855. The Everglades tour is perfect for people seeking a little adventure on their vacation; high speeds and tight turns combine the rush of an amusement park ride with the thrill of a safari. 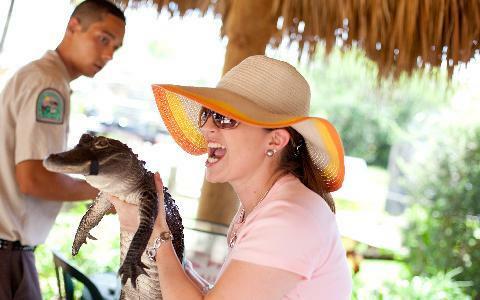 After the boat ride, you'll meet an animal handler and watch an alligator show. The experience is safe and animal-friendly, as the park follows strict National Park guidelines. Safari Park is the top rated alligator farm authorized to operate air boat tours inside the National Park - they were voted a Top 5 Attraction in Miami by USA Today. Come explore the Everglades with us. This family-friendly experience blends education, beauty, and safe thrills, earning glowing reviews from guests. This is for Miami Airport passengers with domestic flights after 5pm. You will arrive to the airport at 3pm. 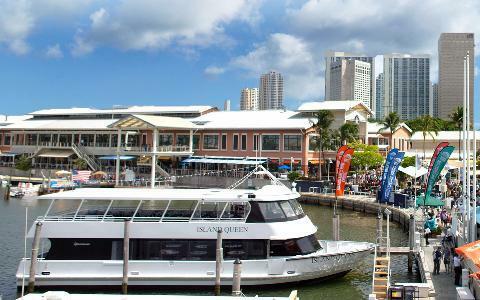 A taxi from Bayside costs $25. Return to the pick-up point location approximately 2:30pm. Hold a baby gator, chat with nature experts, and learn about the area's delicate ecosystem, before you catch the bus back to Miami. This Everglades tour was really great from start to finish, we were picked up from our hotel on time, provided with cold water, sunscreen and bug repellent. The boat tour does go for the full hour and during this time we had 8 alligator sightings! We were able to get quite close to them for photos and the captain turned the boat to both sides so everyone got a close up! After the boat tour we then watched the alligator show and had a free photo holding a baby gator. We read other reviews which advised to take lunch/snacks with you, which we did and were glad as the cafe is not cheap. We did the Everglades tour. We were collected from Hotel and greeted by our driver/guide Angel, who friendly and great at giving us extra information on our journey to and from the park. The boat tour was good we had several sightings. The free pic was a nice souvenir. Worth it for trip out of Miami. picked the Everglades boat tour, GatorBoys show! The trip was well organized, sending out whats up message on the prior evening! By coincidence the driver was also from Hungary so we both shared a lot! I recommend to all of you to hop on for this trip! Great people, focus on us! We did the everglades tour with Daniel as our guide. He was very kind and knowledgable. He took such good care of everyone. We appreciated the free, cold water, sunscreen and bug spray very much. I belive our air boat captain's name was J. T. His boat was called Big Thunder. He was also very knowledgeable and seemed to have the wild birds trained to come to him. At one point I thought it was going to come into the boat! It was a lot of fun. On the other hand, the alligator show left a lot to be desired. They didn't even dry off the benches from the rain. The bus picked us up on time, it was air conditioned, they gave us free, ice-cold water, the information was given by a pre-recorded tape with the driver pressing "next" when we got to the appropriate spot on the road (this is great because you can actually understand the person speaking!!!!). The airboat ride was enjoyable, we saw an alligator show and had the possibility of holding a baby alligator. It was insanely hot out, but it was a very enjoyable trip and definitely worth the money. Their pick-up methods were a little odd, but I guess it made sense. Two busses going on two different tours would pick up passengers from different sides of the city, meet in the middle and swap passengers. Good in theory, but you have to wait if one bus is running slow. If you're from out of town without a car, this is a good tour to experience the Everglades. Some people had luggage which was stored below on the bus. There are earphones for people to listen to the narration on the bus in other languages than English. Best to read the schedule on their website to know what to expect and what to do. The food at the park is expensive and not great. But we did try alligator bites. A small bowl of about 6 pieces was about $10. One can of soda was $2.25. Better to pack a lunch and eat it on the bus. There is time to go to the rest rooms when you get to the park before the airboat ride. But get to the boat as soon as possible and be in the first few groups. Because you go to the alligator show immediately after the boat ride. We were one of the last boats. By then all the seats in the shade for the show were taken. We skipped the show because it was too hot to seat in the sun for 20 mins. There isn't much else to see in the park. The gift shop is unimpressive. The snacks are overpriced. 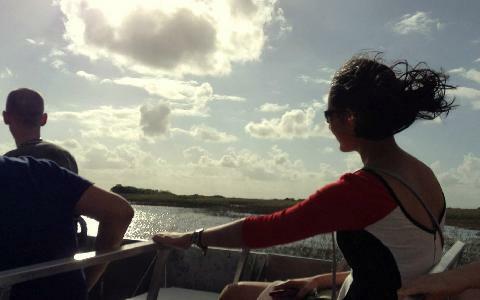 However, the airboat ride is well worth it. The boat is covered so you will not be in the sun. Our captain was funny and informative. We saw alligators and iguanas. This was one of our highlights to our trip to Miami. What is your bus like?